Looking for ways to diversify your portfolio? Consider silver. I personally made a move on silver when it right around $27 an ounce. Where do I store my silver? 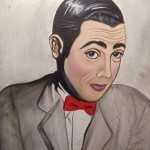 In my vault behind my Pee-Wee Herman Painting of course. If you didn’t catch that.. it was a joke. In fact I’ve never touch physical silver bullion in my life. 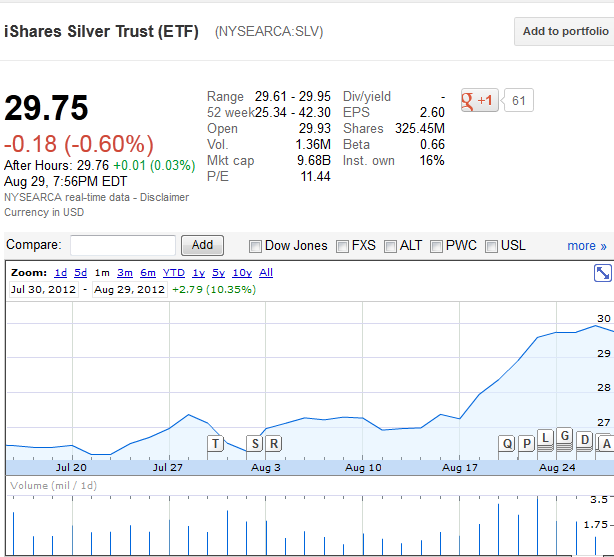 I invested in a silver trust (Symbol: SLV). The trust itself simply holds silver.. good old physically silver. At first glance, you might think, “Why is the trust not worth the same as silver per ounce if it is all physical silver. Well they aren’t the same price because of fees associated with buying and selling silver, administration fees, market speculation factors, and even storage fees. It’s not an exact linear relationship, but for my purpose.. when silver is up, SLV is up. Why wouldn’t I just buy Physical Silver? Often times there is a premium to buy silver and a cost to sell it back. If I had to ballpark silver, I would say it is most likely close to 3-5% each way (6-10% roundtrip). Although the trust does lag behind, it is so much more cost effective than buying and storing physical silver. I feel that silver has come off a high, and is a bit oversold by comparison to gold (this is an opinion). I feel that physical commodities often act as almost a hedge against other stocks. It is very common to have commodities up while stocks are done. Commodities are also global and resistant to domestic inflation. If the world Ends, Is Gold and Silver the place to be? I don’t know, because I honestly don’t plan for the extreme that the “world is going to end.” I would rather invest in food and shelter if I thought that way. The heck with gold and silver. I am long on silver with a trailing stop that guarantees that I cash out with 7% or more gain. As for holding physical silver, if you want to do it. Go for it. But be aware you are a lot more “long” than owning a silver trust. You are less liquid and you are hit by a massive buying/sell premium. But if you do decide to get bullion, check out these super sweet awesome fun pistol bullion pieces. And don’t forget you can buy it via amazon with amazon prime.